Two Washington Post reporters summarize the research of Princeton economists Anne and Deaton Case, the latter of whom went on to win a Nobel Prize in Economic Sciences. Rejected by the highly prestigious Journal of the American Medical Association and the New England Journal of Medicine, the study then was published in the Proceedings of the National Academy of Science. 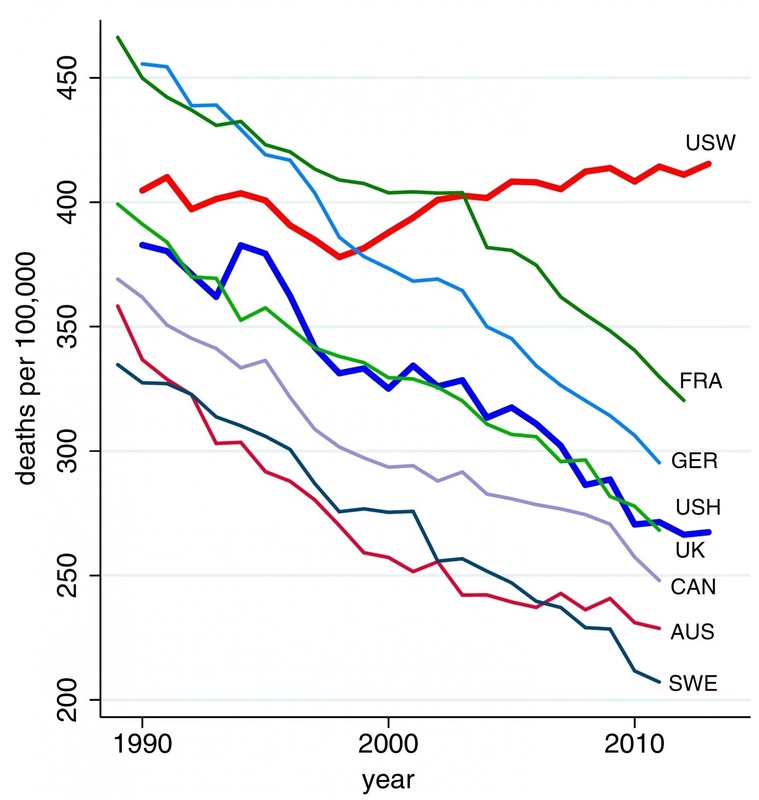 "Drugs, alcohol, and suicide.... are clearly the proximate cause, explains Angus Deaton. Still, David Weir, who reviewed the study for the journal, was surprised that the death rate for whites and blacks has narrowed so much because generally socioeconomic circumstances "gang up on African Americans, who have lower education, lower incomes and race all working against them. 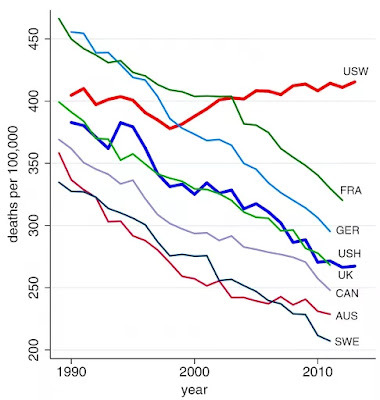 In this case, that's not happening" (below, graph from National Academy of Sciences of the death rate for U.S. non-Hispanic whites-USW, US Hispanics and six comparison countries). There are problems in the white community, ones which no amount of racial mau-mauing by Hillary Clinton can alleviate. They are not as severe as in the African-American community, but they too infrequently have been acknowledged. They are largely ignored by the mainstream, neo-liberal,wing of the Democratic Party, which chooses to emphasize discrimination against blacks and other minorities. Nor will they be addressed at all by the GOP, which is loathe to address real difficulties faced by poor Americans of whatever background. Unlike Benghazi, the IRS, or lack of reverence for the Second Amendment, they are nothing which can be fantasized as Democratic scandals. Republicans will not point to any problems with alcohol, so prominent with their rural base. They will do little about suicide because mental health serves merely as their scapegoat for gun violence. And they are little concerned about heroin because most of them are unable or unwilling to distinguish that deadly drug from the nearly benign marijuana. But most of all, there will be little attention paid to the increasing morbidity of poorly educated whites because the three factors- drugs, alcohol, and suicide- cited are connected to poverty and hopelessness. Republicans aren't serious about that, and Democrats- aside from the Congressional Populist Caucus, Elizabeth Warren, and a few others- are only barely so.